It's the most wonderful time of the year - time to choose the 2018 Buffoon of the Year, presented by our friends at Less Government, More Fun! By now, you know how it works: Our BEL "Conclave" has assembled to review the news of the year and agreed upon the Top 16 political buffoons from government, media, celebrities, pseudo-celebrities, internet infamy and more. 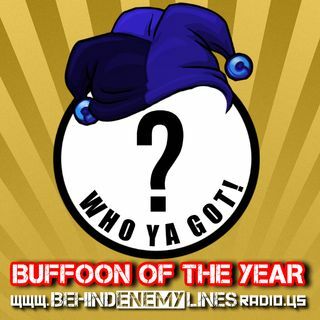 They will now go head-to-head in a tournament where YOU will decide who the bigger buffoon was until one is left ... See More standing as the one and only undisputed 2018 Buffoon of the Year! As we wanted this to be the most competitive class of buffoons in our history, we did eliminate three people from consideration for fear that their high visibility and polarizing partisan nature would skew the results - after all, we are looking for buffoonery, not a partisan measuring contest! So President Trump and Hillary Clinton are out. As is the reigning 2017 Buffoon of the Year, Maxine Waters, who was not eligible this year for fear that her "victory" last year would unduly influence voters (but fret not, she may make a comeback next year... who knows!) Finally, any recent buffoonery (staring right at you, Tom Arnold) didn't make the cut, but will be factored into our consideration for next year. OK, enough of the nonsense, here are our finalists for the 2018 Buffoon of the Year! Oh, and here's this week's show.